AS THE CLOCK struck 9pm at Christ Church in London’s Spitalfields on October 6, the boisterous throng at The World’s 50 Best Bars ceremony fell silent. Members of the Dead Rabbit bar team were among them – ears and eyes fixed on the stage, waiting on the last two names to be called out. They had been here before, at the edge of greatness – twice in the past two years the New York Irish Bar had been named runner-up, twice it had lost to Artesian. 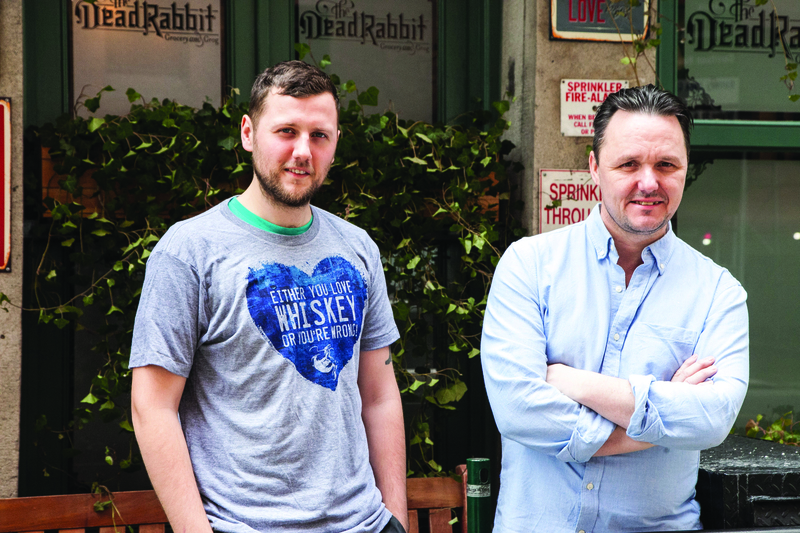 This year, Sean Muldoon and Jack McGarry’s Dead Rabbit was many people’s favourites to win – but with the rejuvenated American Bar at the Savoy also in the final two, the winner was far from a foregone conclusion. For two ambitious Irishmen, a third second-place finish would have been hard to take. In the end it was a case of third time lucky – except there was nothing lucky about how they reached the top of the bar business. While Muldoon took to the stage with that look of a relieved competitor who had finally done what he had set out to achieve, McGarry was back at Dead Rabbit – one of the 14,000 to watch the show by live stream. He may not have been there to share the moment with his long-time business partner, but it seemed equally pertinent that he could host a party at the newly crowned World’s Best Bar. We caught up with him the day after the night before to pose a few questions. HS: You’ve always said you wanted to create the world’s best bar – when was this ambition formed and what drives it? JM: Sean has an ever-burning desire to be the best in the world. My burning desire is to be the best version of myself and push others around me to the same. Our styles complement each other well. We both come from a tough part of Belfast where opportunities are limited. The option was to stay and do something menial or dare to dream and take the world on. We choose the latter. We’ve been operating like this since our Merchant Hotel days in Belfast. Everything we did we wanted to do to the best of our ability. At the Merchant, it was all about challenging the big boys from New York and London. People said a bar in Belfast would never make it. That gave us the fuel to make sure that wasn’t the case. Once we achieved that [the Merchant featured on the World’s 50 Best Bars list in 2011 and won Tales’ Spirited Awards World’s Best Cocktail Bar in 2010] the opportunity presented itself to go to New York and take the fight directly to the doorsteps of the big bars. The Dead Rabbit was all about challenging the misconception that an Irish Bar couldn’t be the best bar in the world. It’s a theme that has been done to death and consequently it’s been cheapened and pigeonholed. We wanted to bring the Irish bar into the 21st century.